The new 2014 BMW 328d, available in rear wheel drive and all-wheel xDrive, will have a 180 horsepower 2.0-liter TwinPower diesel 4-cylinder engine mated to an 8-speed automatic transmission when it arrives in U.S. showrooms this Fall. The 328d Sedan will accelerate from 0 – 60 mph in just over seven seconds and is expected to achieve fuel economy of 32 mpg city/45 mpg highway/37 mpg combined. The options list will include Luxury, Sport and Modern Lines as well as M Sport with detailed specifications and pricing available closer to launch. The all-new 2014 Mitsubishi Mirage 5-door subcompact powered by a 74 horsepower 1.2-liter three-cylinder DOHC engine is expected to achieve fuel economy of 40 mpg combined/37 mpg city/44 mpg highway. For better collision protection Mitsubishi engineers have strengthened the all-new Mirage 5-door by incorporating Mitsubishi's RISE (Reinforced Impact Safety Evolution) impact-absorbing safety cell technology with an impact energy-absorbing front end along with use of high tensile steel in key areas throughout the platform. The World Car awards were inaugurated in 2003, and officially launched in January 2004, to reflect the reality of the global marketplace, as well as to recognize and reward automotive excellence on an international scale. 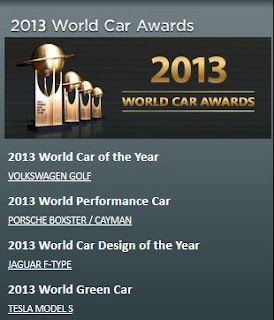 The awards are intended to complement, not compete, with existing national and regional Car of the Year programs. The awards are administered by a non-profit association, under the guidance of a Steering Committee of pre-eminent automotive journalists from Asia, Europe, and North America. There is no affiliation with, nor are the awards in any way influenced by any publication, auto show, automaker, or other commercial enterprise. The new 2014 Infiniti QX60 Hybrid utilizes a supercharged 2.5-liter inline 4-cylinder and an electric motor powered by a compact Lithium-ion battery pack located under the 3rd row seat with an estimated net system 250 horsepower that is projected to get acombined city/highway 26 miles per gallon, a 24 percent increase over standard QX60 models. 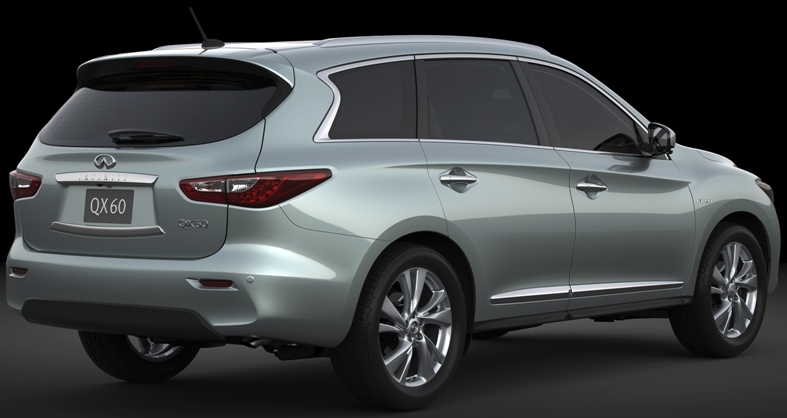 The Infiniti QX60 Hybrid is projected to be priced about $3,000 above the 3.5-liter V6 equipped models. The all-new 2014 Infiniti Q50 sports sedan offered with a choice of a 3.7-liter V6 or new Infiniti Direct Response Hybrid system in rear-wheel drive or all-wheel drive will have an introductory starting M.S.R.P. for pre-orders of $36,450 in the U.S., $900 lower than the base M.S.R.P of the 2013 Infiniti G37 Sedan. Both vehicles are set to go on sale at Infiniti retailers in the United States later this summer. 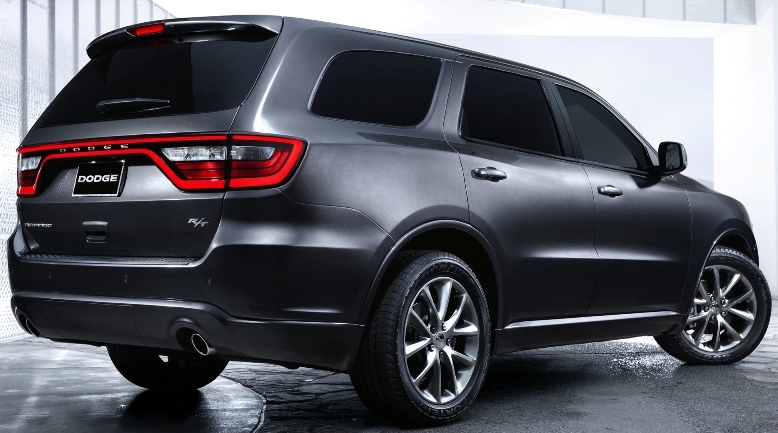 The new 2014 Dodge Durango, available in five trim levels: SXT, Rallye, the new for 2014 Limited, R/T and Citadel, has a standard 290 horsepower 3.6-liter Pentastar V-6 engine paired with the new standard eight-speed transmission and an available 360 horsepower 5.7-liter HEMI V-8 engine with cylinder-deactivation that seamlessly alternates between four-cylinder mode when less power is needed and V-8 mode when more power is in demand to optimize fuel consumption. The new eight-speed automatic transmission with rotary shifter and steering wheel-mounted paddle shifters improves fuel economy up to 9 percent while enhancing performance and smoother shifts. The V-6 engine Durango can tow up to 6,200 pounds and with the V-8 engine up to 7,400 pounds. Production is scheduled to begin in the third quarter of 2013. 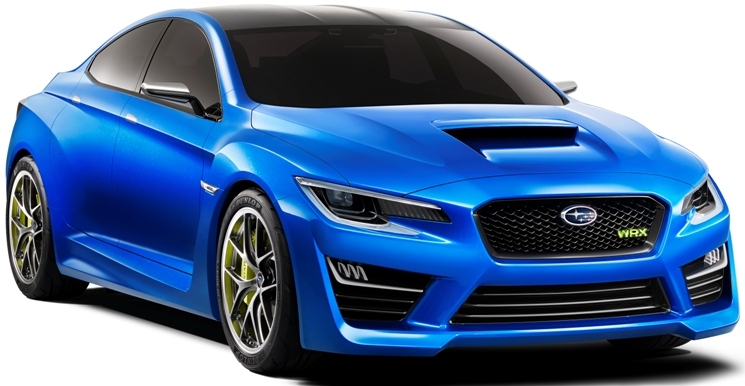 The Subaru WRX Concept is a turbocharged AWD sports car that features a carbon-fiber roof to reduce weight and is lower and wider for low center of gravity. A look to the future for the WRX. The new 2014 Scion tC sports coupe has a 179 horsepower 2.5-liter, four-cylinder engine with either a six-speed manual transmission or an updated six-speed automatic that can change gears nearly twice as fast as the previous model for both upshifts and downshifts. 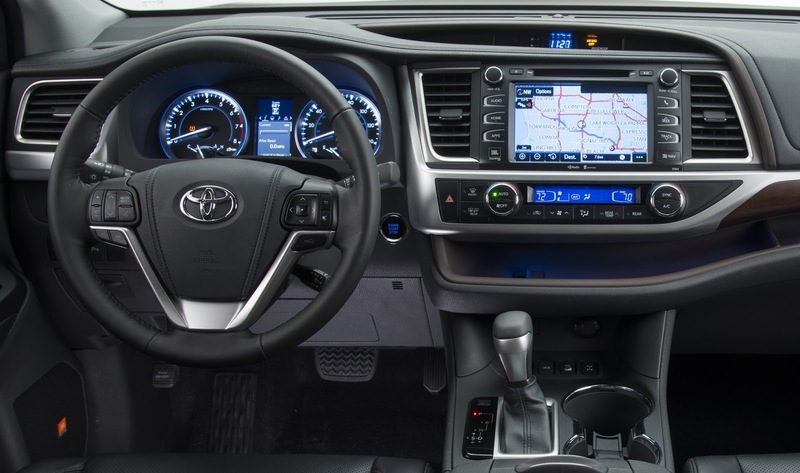 The tC will have the all-new Scion Standard Display Audio with a 6.1-inch LCD touchscreen, auto-off headlamps and an auto-up and down driver's window. The 2014 Scion tC will arrive in dealerships in June. The new Volvo S60 sedan, V60 wagon and XC60 SUV R-Design versions have a 325 horsepower T6 engine with the Advanced Quick Shift transmission optimization software that improves the speed of each gear change, a new feature available on all T6 engines and activated when the transmission is set to sport mode or when using paddle shifters. The new Volvo S60 and XC60 R-Design will be available in all markets that sell the standard versions of these models. Volvo expects that around 10 percent of buyers will choose the R-Design version. The V60 wagon R-Design just made its global debut and the new standard version Volvo V60 will come to the U.S. market in early 2014. 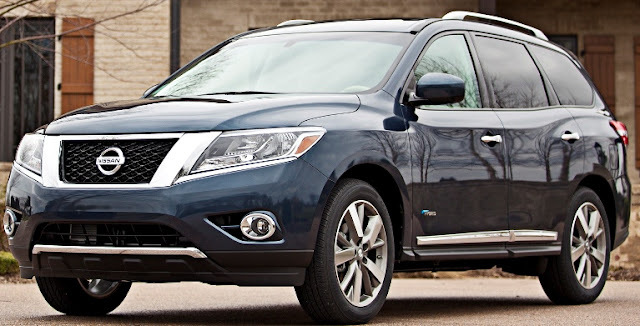 The 2014 Nissan Pathfinder Hybrid will have a supercharged 2.5-liter gasoline engine, 15 kW electric motor and advanced Nissan Intelligent Dual Clutch hybrid control system and get 26 mpg fuel economy (estimated combined city/highway) with a 526-mile driving range. The Pathfinder Hybrid will be priced at around $3,000 above the standard 3.5-liter V6 gasoline engine-powered Pathfinder models. Also announced was the next generation 2015 Nissan Murano based on the recently introduced Resonance Concept which will include a gasoline-electric hybrid powertrain. The restyled 2014 Chevrolet Camaro line represents the most significant redesign since the introduction of the fifth-generation Camaro as a concept car in 2006. 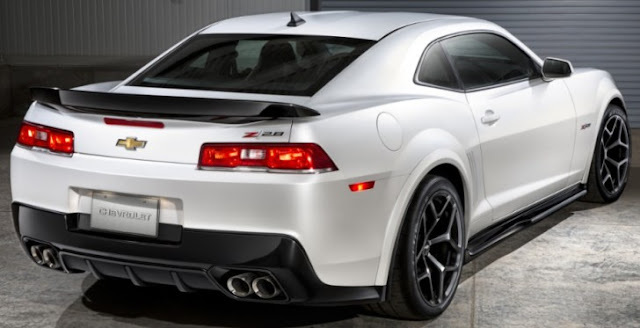 The Camaro SS has a 6.2-liter 426-horsepower LS3 engine. The 2014 Camaro Z/28 (above) has the lighter, naturally aspirated 500 horsepower 7.0-liter LS7 V8 engine first introduced in the Corvette Z06 and is mated to a Tremec TR6060 manual transmission. The 2014 Chevrolet Camaro Z/28 features a revised exterior design and is three seconds faster per lap and weighs 300 pounds less than the 580 horsepower 6.2-liter LSA supercharged engine in the Camaro ZL1. The Camaro Z/28 features 19-inch diameter wheels and tires, which reduce unsprung weight by 42 pounds per car compared to the 20-inch wheels standard on Camaro SS and ZL1. The 2014 Camaro will arrive at Chevrolet dealers later in 2013. 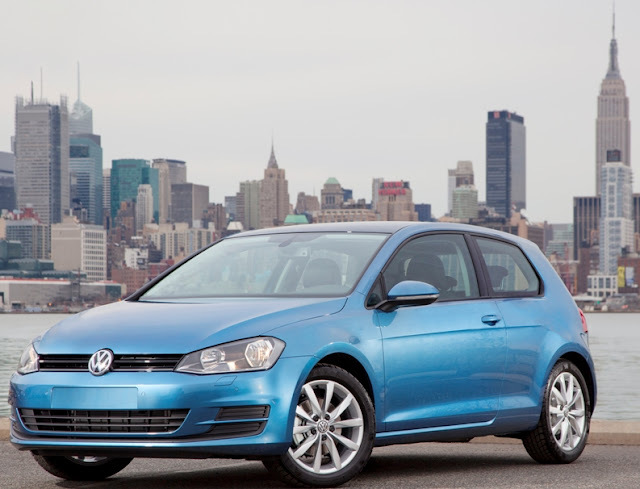 The seventh-generation 2015 Volkswagen Golf is 2.2 inches longer, 0.5 inches wider, 51 pounds lighter and as much as 15% more fuel-efficient than the car it replaces. 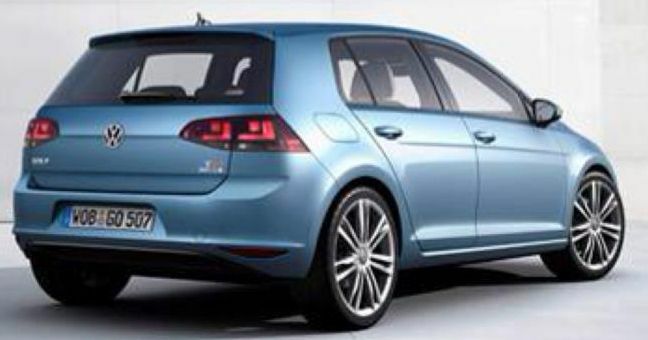 The Golf will be powered by a 170 horsepower 1.8-liter turbocharged, direct-injection four-cylinder TSI engine or a new 150 horsepower 2.0-liter common-rail, turbocharged, direct-injection diesel engine which is 10 more horsepower than the current engine. 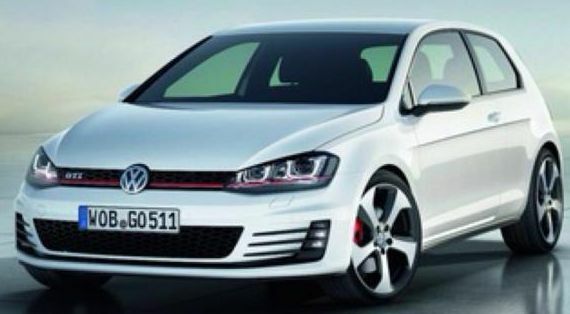 The GTI will also use an uprated version of the 2.0-liter turbocharged TSI engine expected to generate about 210 horsepower and, like the current GTI, the engine will drive the front wheels via either a six-speed manual or six-speed DSG transmission. For the first time, Volkswagen is using touchscreens with a proximity sensor, allowing drivers to change functions with a swipe of the hand, just like a smartphone. The base radio has a 5.8-inch touchscreen and the new navigation systems are DVD-based with a 3D display. The 2014 Mercedes-Benz B-Class Electric Drive, based on the conventionally powered B-Class which made its market debut in 2011, is powered by an electric motor with more than 134 horsepower and a 0 to 60 mph time of less than ten seconds. 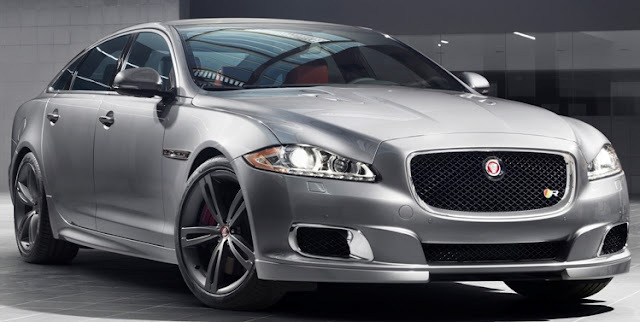 The maximum speed is electronically limited to 100 mph, to get the range to around 115 miles. The B-Class Electric Drive battery can be recharged at any standard domestic power outlet. In the USA, the charging time for a range of about 60 miles is less than 2 hours at 240 V/40 A. The 2014 Mercedes-Benz B-Class Electric Drive will only be introduced with battery electric drive in the U.S. and will be available in the U.S. from early 2014 with the European launch to follow. Move over Nissan Leaf if the price is right. The all-new third-generation 2014 Acura MDX seven-passenger luxury SUV, on a completely new platform, is powered by an all-new 290 horsepower direct-injected 24-valve 3.5-liter i-VTEC V-6 engine with Variable Cylinder Management™ mated to a 6-speed automatic transmission with Sport Mode and Sequential SportShift Paddle Shifters. The new MDX will be offered in both Super Handling All-Wheel Drive™ and, for the first time, a more affordable front-wheel-drive model that gets an EPA rated at 20 city/28 highway/23 combined miles per gallon. Measuring 193.6 inches in overall length, the 2014 MDX is 2 inches longer than the current model riding on a 111-inch wheelbase that's up 2.75 inches from the previous model. 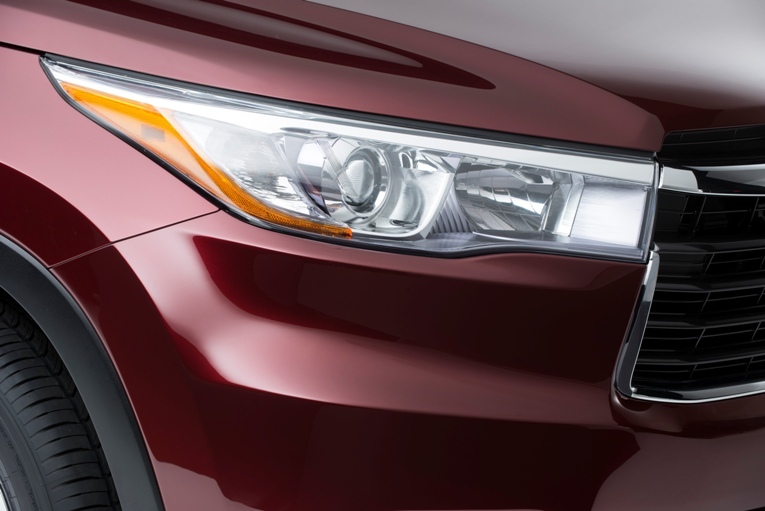 The 2014 Acura MDX will be available in four grades: MDX, MDX with Technology package, the MDX with Technology and Entertainment packages, and the top-of-the-line MDX with Advance and Entertainment packages. The Alabama-made 2014 Acura MDX is scheduled to go on sale at U.S. Acura dealers nationwide this summer with pricing details announced closer to launch. Looks like the New York Auto Show is the SUV show with the new 2014 Acura MDX, 2014 Toyota Highlander, 2014 Land Rover Range Rover Sport, 2014 Infinti QX60 Hybrid, 2014 Subaru XV Crosstrek Hybrid and 2014 Jeep Cherokee all making debuts. The all-new two-door 2014 KIa Forte Koup EX comes equipped with a 173 horsepower 2.0-liter GDI four-cylinder engine mated to a 6-speed automatic transmission and the SX has a 201 horsepower 1.6-liter gasoline direct-injected turbocharged four-cylinder engine that may be mated with either a standard 6-speed manual or optional 6-speed automatic featuring steering-wheel-mounted paddle shifters. 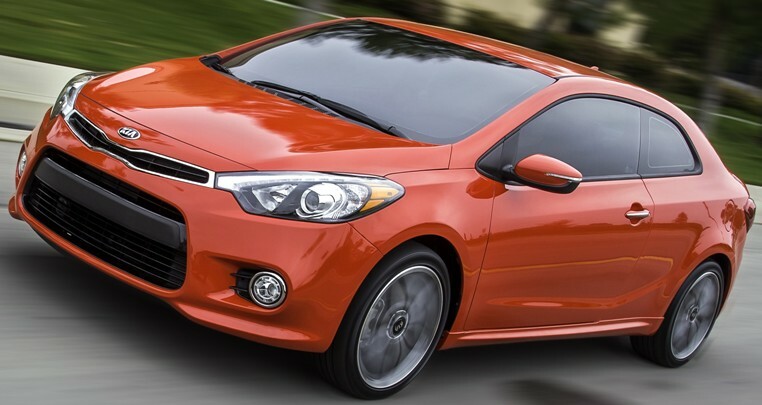 Sales are expected to begin in the fourth quarter of 2013, and pricing will be announced closer to the Koup’s launch. The all-new 2014 Kia Soul urban utility vehicle is 0.8 inches longer and 0.6 inches wider than the current Soul that was first introduced in 2009 and the new body gets a 28.7 percent increase in torsional rigidity over the present Soul. 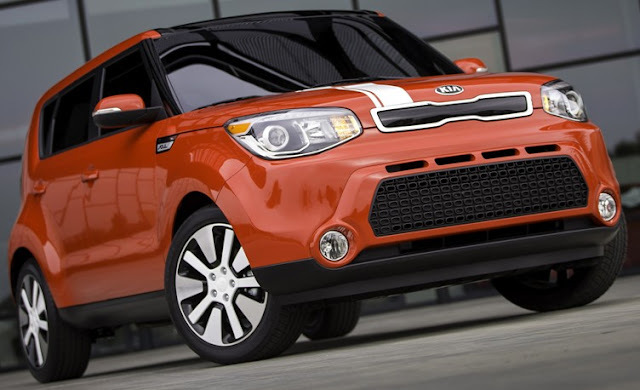 The 2014 Kia Soul has three trim levels: Base, Plus and Exclaim. The Base Soul has a gasoline direct injection 130-horsepower 1.6-liter all-aluminum DOHC four-cylinder engine mated to a six-speed manual transmission or, optionally, to a six-speed automatic. The Plus and Exclaim models get a 164 horsepower 2.0-liter NU power plant. The Plus model may be equipped with either transmission while the Exclaim is available exclusively with the six-speed automatic. U.S. sales are expected to begin in the third quarter of this year. Pricing will be announced closer to the Soul’s launch date. 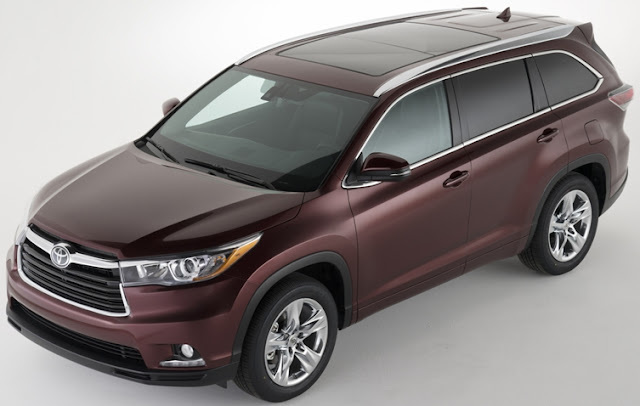 The all-new 2014 Toyota Highlander is 2.7 inches longer than the previous model at 191.1 inches and 0.6 inches wider on the same 109.8 inch wheelbase. The 8-passenger Highlander has an overall interior width increase of 4.3 inches in the third-row and a standard recline function creates added room for up to three passengers. Rear cargo space behind the third-row has increased by up to 34 percent for added storage. The 2014 Toyota Highlander offers a 2.7-liter four cylinder and 3.5-liter V6 with new 6-speed Automatic Transmission will be mated to the V6. The 3rd-generation Highlander will continue to offer a Hybrid Synergy Drive system paired to the 3.5-liter V6 gasoline engine with a high-torque electric drive motor-generator. The new Highlander has standard Display Audio with an Integrated Backup Camera, or an optional 8-inch touch screen Navigation with the Entune™ multimedia system. Highlander also has a Blind-Spot Monitor with Rear Cross Traffic Alert, Lane Departure Alert System, Auto High Beam headlamps, and a Pre-collision System with Dynamic Cruise Control. New available features include rear parking sonar, Blind Spot Monitor, Lane Departure Alert, Rear Cross Traffic Alert, and a Pre-collision System. 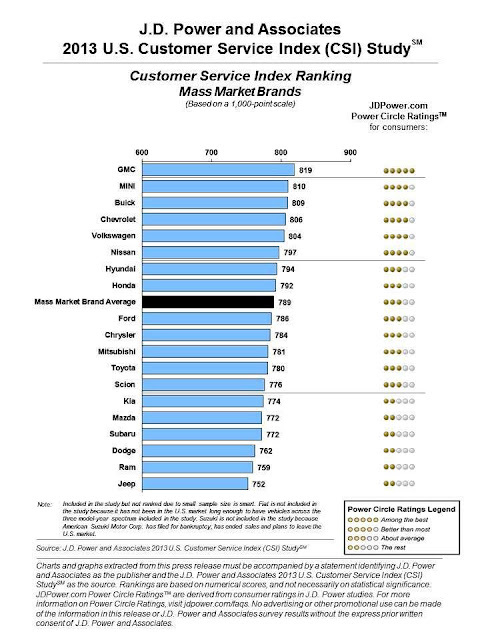 Bill Fay, Toyota Division Group Vice President and General Manager at Toyota Motor Sales, U.S.A. said "We listened and made improvements where it counts for consumers. Our goal was to create a mid-size SUV with "No Sacrifice”. Current owners told us that Highlander is “just the right size” for maneuverability, but that it could use some extra space. So, we increased passenger seating capacity AND cargo capacity through structural changes and a close attention to interior packaging. We were able to achieve this without greatly expanding the external size of the vehicle." The all-new, Indiana-made Highlander will reach dealer showrooms in early 2014. The all-new Range Rover Sport is almost 2.5 inches longer than its predecessor and about 6 inches shorter than its Range Rover sibling and will have a choice of a 510 horsepower 5.0-liter supercharged V8, a new 340 horsepower 3.0-liter supercharged V6, a 258 horsepower 3.0-liter turbo-diesel V6 and a 292 horsepower diesel SDV6. Later this year a high performance 339 horsepower 4.4-liter SDV8 diesel version is coming and a diesel Hybrid model will be available to order later this year for delivery in 2014. A choice of two full-time 4WD systems will be offered. One system provides a two-speed transfer case with low-range option, for the most demanding off-road conditions with a front-rear 50/50 percent default torque split, and 100 percent locking capability. The all-new Range Rover Sport goes on sale during the third quarter of this year. The all-new third generation 2015 Audi A3 and sporty 2015 Audi S3 (above) sedans are coming to showrooms in the first quarter of 2014 with a choice of a 170 horsepower 1.8 TFSI, a 150 horsepower 2.0 TDI clean diesel for the A3 and with a high-output 2.0 TFSI engine with power still to be announced for the high performance S3. All engines mated to the standard 6-speed S tronic® transmission. The A3 will offer MMI® technology, Audi drive select, 4G LTE connectivity and Bang & Olufsen® audio. The Audi A3 base model comes equipped with standard features that include leather upholstery, Bluetooth® technology, rain sensing wipers, Audi pre sense basic and a panoramic glass sunroof. Audi also confirmed that it will be adding the A3 Sportback with a plug-in gasoline electric hybrid (PHEV) model in the U.S. market. The 2014 Honda Odyssey Touring Elite will offer HondaVAC, an in-vehicle vacuum system developed in conjunction with Shop-Vac, when it hits Honda dealerships nationwide this summer. The refreshed Odyssey Touring Elite will also come equipped with an expanded view driver's mirror, forward collision warning and lane departure warning. The all-new third-generation 2014 Cadillac CTS sedan is five inches longer and also lower than the current model and is offered with a 420 horsepower twin-turbo V-6 engine mated to an eight-speed automatic transmission. The 2014 CTS is also available with a naturally aspirated 321 horsepower 3.6 liter V-6 also matched with the new paddle-shift eight-speed automatic in rear-wheel-drive models or six-speed automatic with all-wheel drive and a 272 horsepower 2.0 liter turbocharged engine paired with a six-speed automatic. The new CTS sedan offers Automatic Parking Assist which enables the car to park itself in parallel spaces using ultrasonic sensors. The CTS has 20-way adjustable front seats, a motorized cup holder lid in the center console, an available 12.3-inch high-resolution, configurable LCD instrument cluster display, Panic Brake Assist, Forward Collision Alert, Automatic Collision Preparation, Lane Departure Warning, Side Blind Zone Alert, Rear Cross Traffic Alert and Rear Vision Camera With Dynamic Guidelines to name a few features. Production of the 2014 CTS begins this Fall and is poised to take on its German rivals. The new 2014 Buick LaCrosse, in front-wheel-drive or all-wheel-drive, offers a 2.4 liter engine with eAssist light electrification technology or a 3.6L direct-injected V-6 paired with a six-speed automatic transmission and goes on sale this summer. New radar- and camera-based safety features include Side Blind Zone Alert, Lane Change Alert, Lane Departure Warning, Forward Collision Alert, Rear Cross Traffic Alert and Automatic Collision Preparation. GM’s patented Safety Alert Seat works with these features, providing seat vibration pulses indicating the direction of a potential crash threat. The new 2014 Buick Regal (pictured in the front and back) has a new 2.0 liter turbo engine as well as a 2.4 liter engine with both mated to a six-speed automatic transmissions with a six-speed manual available in the Regal GS. 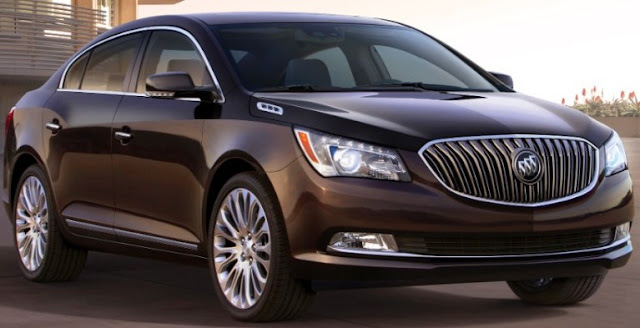 The new Regal introduces new radar- and camera-based safety features including Rear Cross Traffic Alert, Lane Change Alert, Side Blind Zone Alert, Lane Departure Warning, Forward Collision Alert and Collision Mitigation Braking for surround protection. In-vehicle connectivity is enhanced with next-generation IntelliLink, featuring simpler, more intuitive controls and natural speech recognition. 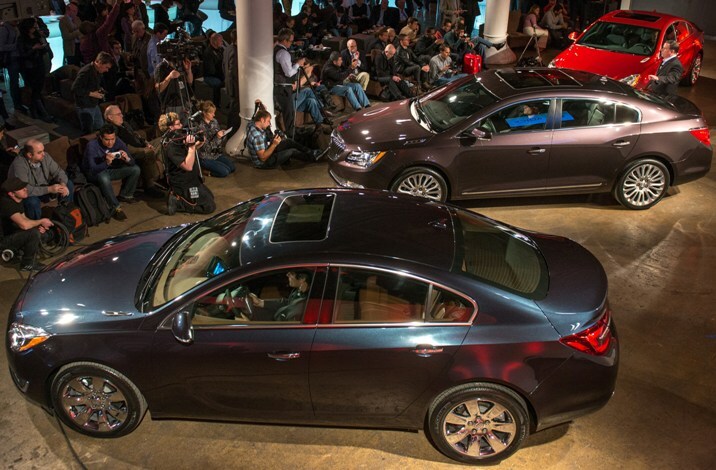 The 2014 Buick Regal goes on sale this Fall. 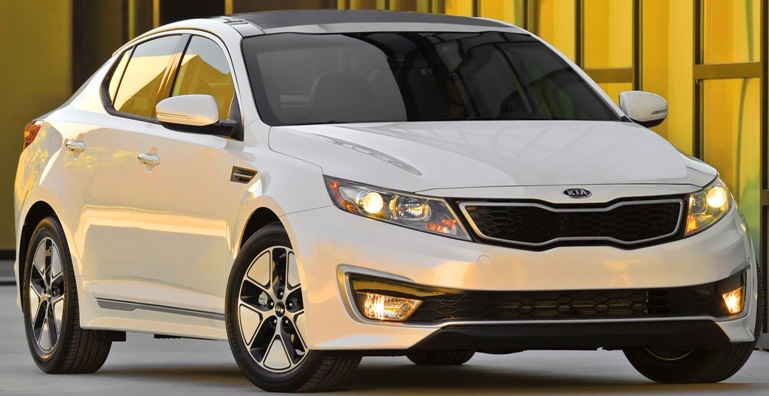 The updated 2013 Kia Optima Hybrid has a more robust 47 horsepower electric traction motor, a stronger Hybrid Starter Generator and a more powerful 47 kW Lithium Polymer battery than the previous model producing a combined 199 horsepower and 235 lb-ft of torque, an increase of 40 lb-ft. The 2013 Kia Optima Hybrid LX starts at an MSRP of $25,900 and the fully loaded EX at an MSRP of $31,950 (excluding destination and handling, taxes, title, license fees, options and retailer charges). 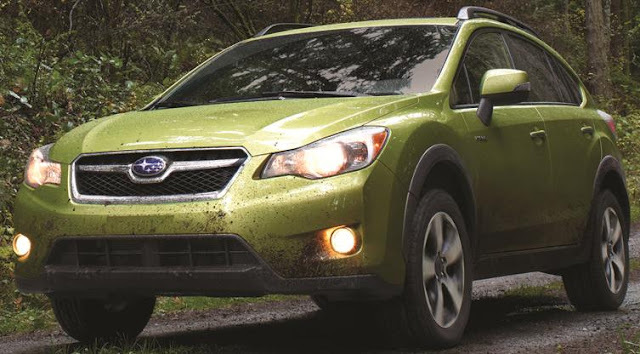 The base model achieves an EPA estimated 36 mpg city, 40 mpg highway and 38 mpg combined and the EX model delivers an EPA estimated 35 mpg city, 39 mpg highway and 37 mpg combined. The 2013 Optima Hybrid more trunk space due to the repackaging of the vehicle's battery pack. The EX model adds navigation with Rear-Camera Display, an 8-speaker Infinity® audio system, panoramic sunroof, heated and ventilated front seats and 17-inch wheels. Great looking hybrid that carries a 10-year/150,000 mile hybrid system warranty (excluding PA and WA). 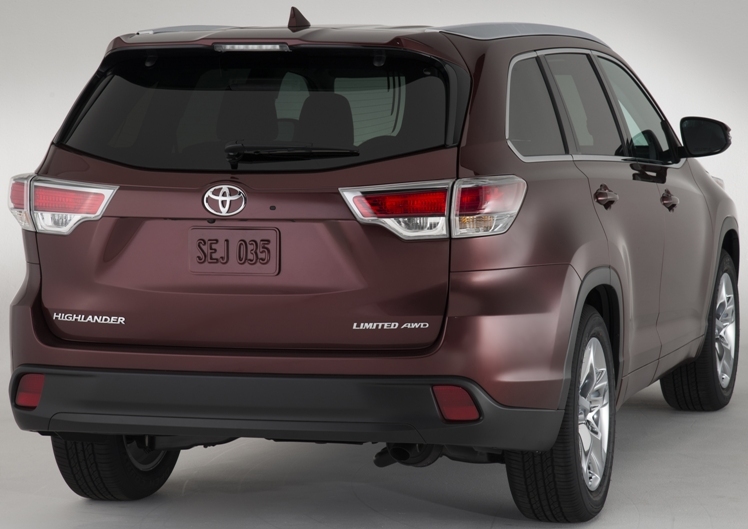 The all-new 2014 Toyota Highlander mid-size SUV will makes its world debut at the New York Auto Show next week. The Highlander was launched in the 2001 model year with the larger second generation version arriving in 2007 which coincidentally saw a sales decline, either because of its bigger size or more likely due to the "end of the world" recession that hit. The latest RAV4 lost its exposed rear spare tire so let's see if the third generation Highlander sheds a little size for those who loved the smaller first generation version. My brother loves his first generation model Highlander hybrid. It's a vehicle that has been high on my list so I'm hoping the all-new is all-right. The Subaru XV Crosstrek Hybrid, the brand’s first-ever production hybrid vehicle, will debut at the 2013 New York International Auto Show next week along with an all-new performance concept car. The 2014 SRT Viper TA, based on the SRT Viper model, with a 640 horsepower all-aluminum 8.4-liter, mid-front V-10 overhead-valve engine will be shown at the New York International Auto Show. Only 33 units of the 2014 SRT Viper TA in Crusher Orange will be built beginning in third quarter 2013. The all-new 2013 Audi RS 5 Cabriolet with a 450 horsepower naturally aspirated 4.2 liter V8 engine starts at $77,900 next month with an EPA estimated 16 city / 22 highway/ 18 combined and no gas guzzler tax. The RS 5 Cabriolet will have an optional ceramic brakes for the front rotors, a standalone package priced at $6,000. The all-new 2014 Kia Forte sedan propelled by either a 148-horsepower 1.8-liter engine or a 173-horsepower 2.0-liter 173-horsepower GDI starts at $16,700 including $800 in destination charges for the LX with a 1.8-liter engine and manual transmission. The LX with a 1.8-liter engine and automatic transmission has a base price of $18,200 and the EX with a 2.0-liter GDI powerplant and automatic transmission starts at $20,200. The 2014 Jaguar XJR Sedan with 550 horsepower will make its global debut in New York next week. American Honda has selected MediaVest as the media agency serving both Honda and Acura brands, with RPA the creative agency for the Honda automobile brand and Mullen as the creative agency for the Acura brand. RPA, Mullen and MediaVest together with Muse Communications and Orci, which retain the multicultural assignments, will report directly to American Honda rather than through a single agency. Santa Monica-based RPA or Rubin Postaer and Associates has had the Honda Corporate business a long time and took over the Acura account from Suissa Miller in 1999. 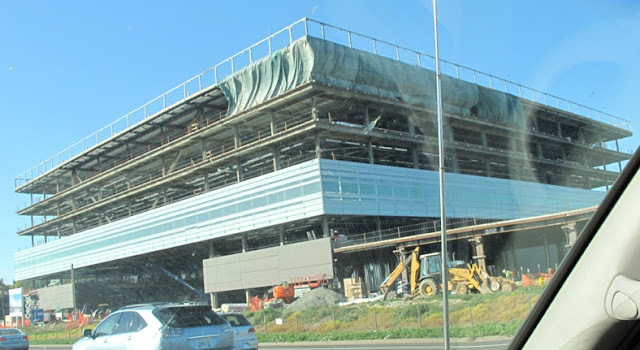 Word is RPA has a strong connection to Honda's Japan headquarters so may not have been in jeopardy over losing the entire business though they did lose the Acura work. Mullen, headquartered in Boston, with accounts like General Motors, Google, Adidas and Jet Blue, according to their website client list and will now get the Acura creative assignment as the brand is in the midst of the complete makeover of its product lineup. In 2012, Acura launched a redesigned RDX and new ILX entry-luxury sedan and for 2013, the all-new 2014 RLX flagship sedan went on sale with an all-new 2014 MDX coming to market by mid-year. Acura has also announced plans for the introduction of the next generation of the Acura NSX (above) in about two years. Can't wait to see their ads and, more importantly, how they affect sales. Hyundai's new 496,700-square-foot Fountain Valley, California, campus, currently under contruction (see above), will have a six-story office building and technical service center with 1,300 people working there. I took the photo Monday March 11th while driving on the 405 North freeway. The J.D. 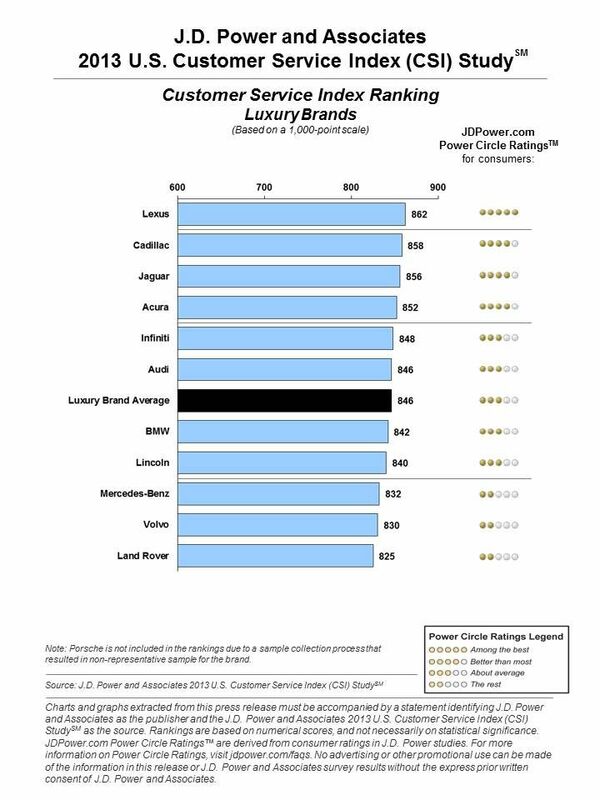 Power and Associates 2013 Customer Service Index Study, Lexus ranks highest among luxury nameplates for a fifth consecutive year, and GMC ranks highest among mass-market nameplates. Among luxury brands, Cadillac, Jaguar, Acura, and Infiniti follow Lexus in the rankings. 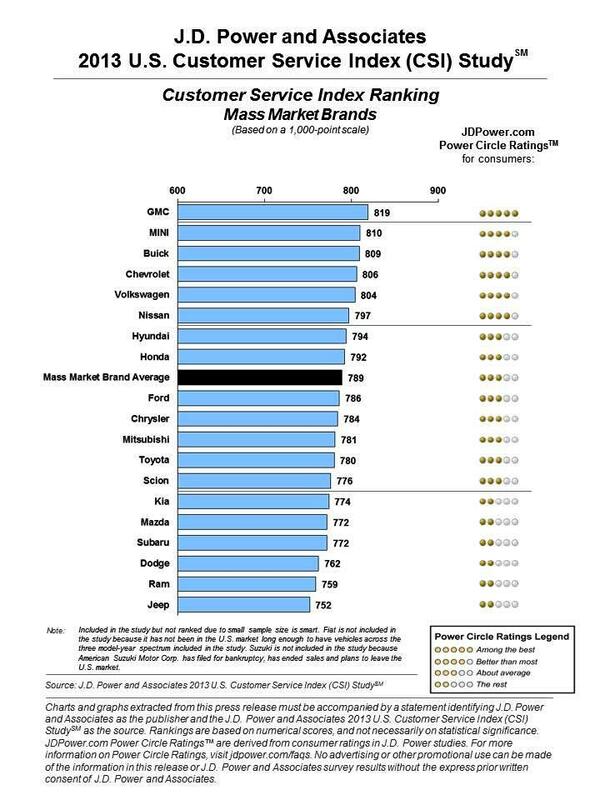 Among mass market brands, Mini, Buick, Chevrolet, and Volkswagen follow GMC. The CSI Study measures customer satisfaction among vehicle owners who visit a dealership service department for maintenance or repair work during the first 3 years of ownership. Satisfaction is examined across five measures, listed in order of importance: service quality; service initiation; service advisor; service facility; and vehicle pick-up. Survey responses received from 91,000 owners and lessees of 2008 to 2012 model-year vehicles were included in the study. The all-new BMW 3 Series Gran Turismo makes its U.S. debut at the New York International Auto Show in two weeks and will arrive in U.S. showrooms this summer as a 2014 model as both a 328i and a 335i. The BMW 328i Gran Turismo has a 240 horsepower 2.0 liter TwinPower Turbo 4-cylinder engine and the BMW 335i Gran Turismo has a 300 horsepower 3.0 liter inline 6-cylinder engine. The new BMW 3 Series Gran Turismo is larger than the Sedan and Sports Wagon variants of the 3 Series. 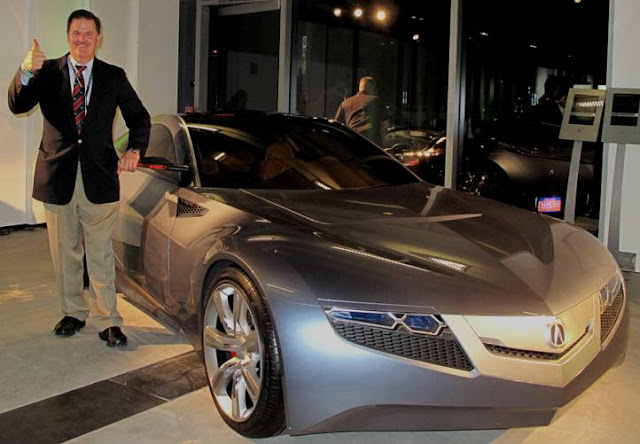 Robert Downey Jr. in his role as Tony Stark, the title character in Marvel’s Iron Man 3 slated for a May 3 release date, will be behind the wheel of the all-electric Audi R8 e-tron sports car prototype. Oscar® winner Gwyneth Paltrow returns as Virginia “Pepper” Potts, CEO of Stark Industries and girlfriend of Tony Stark, who drives an Audi S7 Sportback. The 2015 VW Golf and VW GTI will make their U.S. debut at the New York International Auto Show. The all-new Range Rover Sport will make its global premiere on the eve of the 2013 New York Auto Show in two weeks on March 26th with full details. It follows the launch of the Range Rover Evoque in 2011 and the all-new Range Rover in 2012. 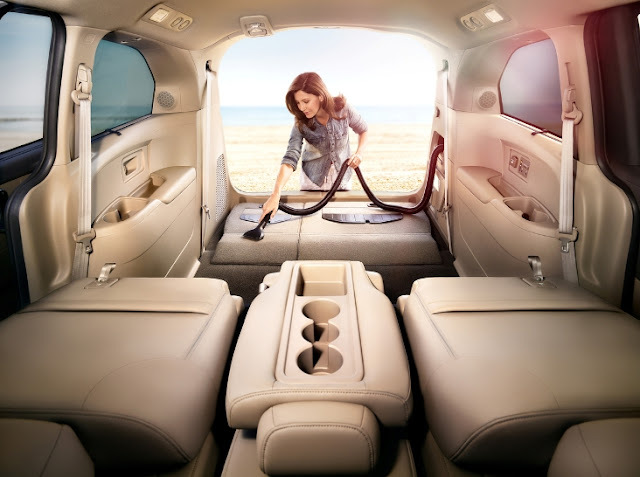 The 2014 Infiniti QX60 gasoline electric hybrid model powered by a 2.5-liter supercharged engine and 15 kW electric motor with an estimated 250 horsepower will hit showrooms this summer joining the Q70 Hybrid (currently available as the M Hybrid) and previously announced Q50 Hybrid from Infiniti. The new Infiniti QX60 was launched in early 2012 as the Infiniti JX35 and the hybrid is projected to be priced about $3,000 above the non-hybrid models. The QX60 Hybrid's Infiniti Direct Response Hybrid® system uses a compact Lithium-ion battery and electric motor to provide supplementary power through its one-motor/two-clutch system. The new Infiniti QX60 Hybrid is projected to get 26 miles per gallon. Ferrari's LaFerrari with hybrid technology has an 800 horsepower 6.2 liter V12 engine and an electric motor that adds a further 163 horsepower for a total of over 960 horsepower. Ferrari says that the HY-KERS system makes LaFerrari the most high performance and efficient Ferrari ever built. Utilizing Ferrari’s Formula One racing expertise with KERS systems which has been further developed for application to road cars, the HY-KERS guarantees maximum integration between the V12 and the electric motor. The high levels of torque at low revs from the electric motor allowed the engineers to optimize the internal combustion engine’s performance at higher revs. Check out the LaFerrari website. Tutto bene! The 2014 Chevrolet Corvette Stingray convertible will deliver an estimated 450 horsepower from its LT1 6.2 liter V-8 direct injection engine with Active Fuel Management and continuously variable valve timing that is expected to beat the current model in fuel economy. The Corvette Stingray convertible features an all-new, fully electronic top that can be lowered remotely using the key fob and go up or down at speeds up to 30 miles per hour. Nice wheels!